When Ford Motor all but eliminated passenger cars from its North American lineup earlier this month to concentrate on trucks and S.U.V.s, it turned the page on a long and storied history of now-defunct but once red-hot nameplates: the Model T, the Model A, the Galaxie, the Fairlane, the Thunderbird and the Falcon, to name several. There was one conspicuous survivor: the Mustang. For me, the Mustang’s reprieve came as welcome news: I took my driver’s test in my mother’s 1967 turquoise Mustang notchback. On the rare occasions I was allowed to drive it, it conferred instant status and triggered unabashed envy among my high school classmates. That’s because in its last earnings report, Ford revealed for the first time that a relatively small number of products, including the hugely popular F-150 pickup truck series, accounted for 150 percent of its earnings before interest and taxes, with profit margins in the midteens. Another group was barely profitable. By contrast, Ford said its “low performing” products lost money, with negative margins of more than 10 percent. Mr. Jonas applauded Ford’s decision to drop most of its passenger cars, assuming the company actually follows through on it. “If a disproportionate effort is going into products that don’t make money and consumers don’t want, then what are they doing?” he asked. Ford doesn’t break out financial results by model, but Mr. Jonas believes the Mustang is modestly profitable. The base hardtop starts at $25,845, but popular options can quickly drive up the cost. The convertible starts at $31,345. The most popular model, the Mustang GT fastback, can easily top $40,000, and the 526-horsepower Shelby GT350 starts at more than $57,000. A racing version of the Mustang Cobra can hit six figures. From the day it was introduced 54 years ago, Mustang was positioned as a stylish, affordable and practical alternative to expensive European sports cars. In various tests, the Mustang GT still compares favorably to the Porsche 911, which starts at over $90,000. So iconic is the Mustang that it has been commemorated with a Postal Service stamp — twice. The latest one, in 2013, depicts a blue 1967 model bisected by two white stripes. Mustangs have appeared in countless movies and television shows, becoming an indelible image of American culture. In “Goldfinger,” James Bond ran a white 1965 Mustang convertible with red interior off the road. A souped-up 1967 Mustang fastback stars in “The Fast and the Furious: Tokyo Drift.” But Mustangs aren’t all about high testosterone. 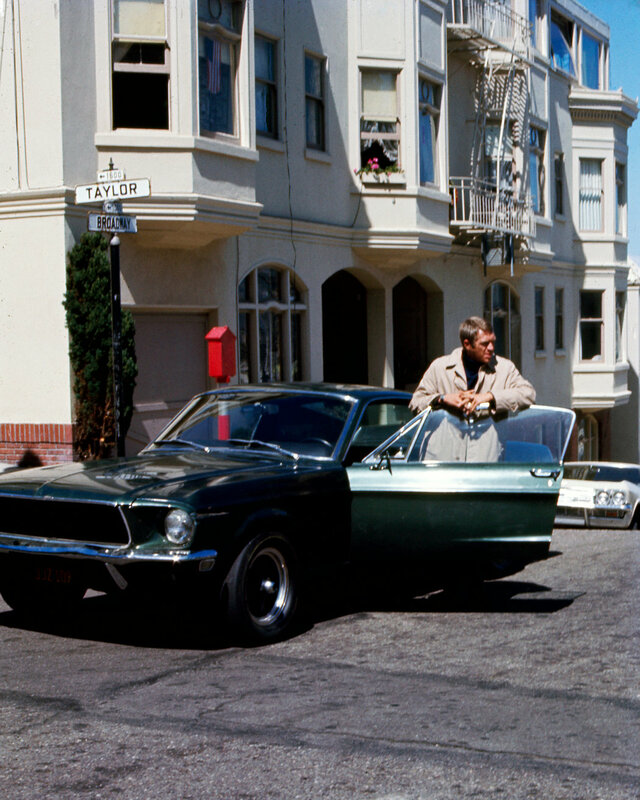 A 1966 convertible is featured in “The Princess Diaries,” and Ford said 27 percent of Mustang buyers are women. William Clay Ford Jr., Ford’s executive chairman and the great-grandson of founder Henry Ford, is a Mustang fanatic, with 20 versions in his personal collection. Mr. Ford showed up at the company’s annual Mustang birthday party last month in a navy blue 1968 Mustang Shelby 500 convertible with a white top. Next week, Bonhams is auctioning several vintage Mustangs previously owned by Carroll Shelby, the racecar driver and automotive entrepreneur who developed high-performance Shelby Mustangs in collaboration with Ford starting in the 1960s. A 1968 Mustang GT 350 and a 1969 GT 500 are each estimated to fetch $80,000 to $100,000 at the June 3 auction. I found a turquoise 1967 Mustang notchback that looked identical to my mother’s car listed on the Hemmings vintage car site for $37,900.